Biological aging or senescence is the steady decline of cellular function with age. There are a number of rationales that explain why senescence occurs, including changes in gene expression, or damage that is accumulated throughout the lifetime of a cell. Many questions surrounding how to overcome senescence by means of slowing it down, stopping it or potentially reversing it, are the focus of my research project. The cell cycle lies at the heart of understanding senescence. Teasing apart cell cycle regulation mechanisms and how they are involved in bypassing senescent barriers is critical, especially regarding implications that these mechanisms may have on cellular reprogramming, neural stem cells and tumourigenesis of the central nervous system. My research focuses on the role of Spy1, a cyclin-like protein, which has been shown to override replicative senescence. As has been previously mentioned by my lab mates, Spy1 can bind, and activate CDK1/2 uniquely without the need of activating phosphorylation and dephosphorylation events to take place. My curiosity with cellular senescence began when I started elucidating Spy1’s role in overcoming reprogramming induced senescence; a unique senescent barrier that somatic cells succumb to on their way to induced pluripotency. 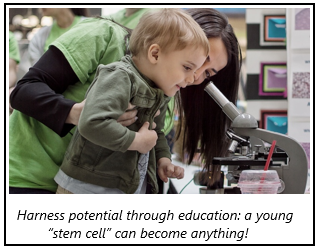 Induced pluripotent stem cells have changed the world of regenerative medicine and remain a hot topic with researchers around the globe. We’ve gathered some interesting data that suggests Spy1’s role is essential in overriding reprogramming induced senescence and this is unique to other cyclins. We’ve shown that this leads to an increase in the number of induced pluripotent stem cells that are created from the process. We are currently picking apart some interesting mechanisms of why this may be. Another piece of my project focuses on Spy1’s role in the neural stem cell population of the brain. 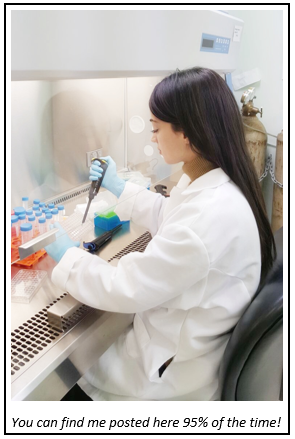 We have created a transgenic mouse model system where we can induce the expression of Spy1 under the Nestin+ stem cell population of the brain at any given time, allowing us to investigate its role in neurogenesis and neural stem cell populations throughout life. To date, I’ve been able to show the inability of these cells to terminally differentiate into neurons. Interestingly, although cells expressing Spy1 have increased proliferation rates, their population is maintained throughout life. This naturally brings forward hypotheses of how this stem cell pool is maintained into old age, and what this means to the whole organism in terms of central nervous system tumourigenesis and neurodegenerative diseases. I am lucky to work alongside an amazing research associate in the lab, Dr. Dorota Lubanska, as well as a group of highly motivated and dedicated undergraduate students in a concerted effort to contribute to science every day. All scientists, whether they are biologists, physicists, chemists, computer scientists, to name a few, are driven to their work because they want to make things better. The knowledge that we gain from science helps us figure out novel ways to fight diseases, create energy, protect natural habitats, connect populations, overcome adversity and much more. As demanding as a Ph.D. can be, the privilege of getting to be creative and answer important questions in a fascinating environment truly makes up for the workload. Answers to these questions will help us understand the world more and more every day. However, the curiosity behind research questions inevitably means that failure will occur, sometimes more than we’d like. Experiments have to be repeated over and over. Some days it gets hard to remind ourselves of our goals and our vision, especially days when we are fed up with yet another failed experiment. I must note, that with persistence, patience, and continued motivation, you’ll happily surprise yourself by learning something fascinating along the way and ultimately contributing to science. 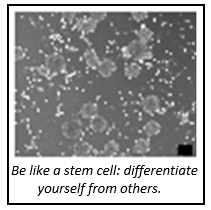 Induced pluripotent stem cells have taught me the importance of resetting and redefining. Every day we have the potential to re-evaluate our priorities. One thing that keeps me motivated and helps me escape the repetitiveness of the lab bench is communicating my science to others. I truly value how important public education is, and how everyone should be encouraged to gain insight into what I do as a scientist and to support research. This way, I am also challenging others to reset and redefine their views on research. In addition, cellular senescence constantly reminds me that our lives do in fact have an end. It is imperative that we are continually aware of this and adapt the mantra of “sometimes you win, sometimes you learn”. If put into perspective, nothing in science is ever a loss. This entry was posted in In the spotlight and tagged Aging, Biology, Brain, Brain Tumour Foundation of Canada, Canadian Cancer Society, Cancer research, Cell Cycle, CIHR, community, Graduate Student, Health, Neurodegenerative diseases, Neurogenesis, PHD, PHD student, Pluripotent stem cells, Porter Lab, Senescence, Stem Cells, Transgenic mouse, University of Windsor, Windsor Cancer Research. Bookmark the permalink.